Of all the buzzy web companies that will define my generation, Airbnb is likely the one I’m most jealous of not creating. I joined the peer-to-peer housing platform in December 2011 and took my first trip using the service in February 2012 to Birmingham, Alabama with my then girlfriend SACM. More than four years later, I continue using the service to book travel accommodations, preferring the service for homey placements in residential neighborhoods with hosts who can give local recommendations. I just find it far more interesting than a hotel — it helps that they’re almost always more affordable too. So I was excited that I could combine these interests — welcoming guests, offering advice and making some additional money — as an Airbnb host when SACM and I bought a home together a year ago. Last month marked a year of our hosting guests via Airbnb. To celebrate, I wanted to share lessons, advice and, yes, data from the experience. Joe is a friendly Filipino private car driver who has lived and worked in Doha, the capital and dominant city of tiny Persian Gulf country Qatar, for the last decade. He forces a laugh and answers “maybe” to any question I ask him that seems to make him uncomfortable. Last month, I was in Qatar to mentor at a hackathon organized by Aljazeera, the global news organization based in Doha. Leading up to and during my time there, I did a lot of reading about the Gulf. I had a couple dozen conversations with people who live there, like Joe, and I did a fair amount of exploring parts of Doha, or at least as much as I could considering I spent most of my short few days there inside a convention center. I found the country so interesting (and complicated) that I wanted to share nearly everything I learned about the Arab desert nation state. Find that below. For Story Shuffle 7, held in a fine rowhome in the Newbold section of South Philadelphia inside a beautiful and eventually stormy night, I told the story of my first hitchhiking experience in South Dakota. My lesson: trusting in strangers is a great risk that often comes with great reward. Check out all the stories here. Listen to mine here or by using the player below. Four years later, I’m finishing this piece of archiving business. A couple months ago, I announced I had moved my honors thesis to a subdomain of this site for the sake of organization and archiving. Following up on that resolution to make more tidy a rambling online portfolio, I have brought another dated, collection of work of which I am proud under this house. I spent the better chunk of 2006 in Tokyo video podcasting, writing, traveling and learning on behalf of NBC Universal Digital Studios. Now all of that work can be found at japan.christopherwink.com. See all the Episodes here and all the Archives here. Go and explore. Short, bad titles — The post headlines were all short and sometimes not even descriptive. I didn’t recognize then the importance. I wrote a lot — I far outpaced all of my fellow castmembers in output, which is great, but I could have made much of the content terser and more straightforward. I actually had comments — On many posts, I had a handful of comments. I haven’t transferred them… yet. I never linked — I didn’t have a single link to a past post. Photo albums, not in posts — Photos and the video episodes were never embedded. This is the one major change I’ve made, by incorporating them. Yes, I called posts ‘blogs’ — But that was 2006. What’s the excuse today? I learned and experienced so damn much — I interacted with an audience and explored and created multimedia, but ultimately, I was just a young kid learning. ..And what a clear stepping stone toward the WDSTL podcast I did while in Western Europe. On Christmas Eve, why not discuss gifts. For, what, the past few hundred years, the more far-flung and exotic the purchase or discovery, the better. Those emotions are mixed up into colonialism and exploration and Manifest Destiny and so many human and American spirits that I don’t care to explore them. But I think there’s something changing there. 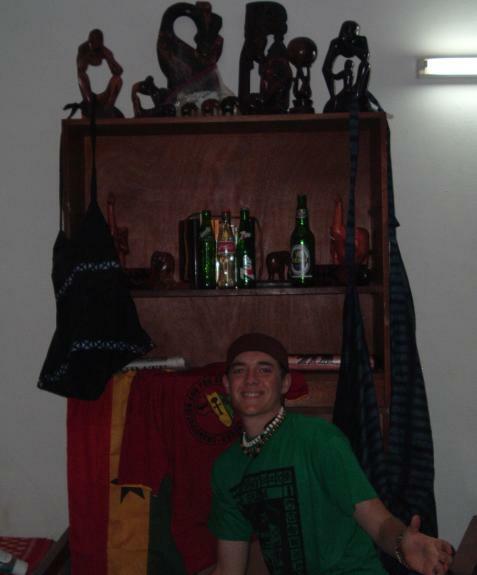 In 2005, I spent a small fortune in the local currency on hand-crafted wood carvings and jewelry from new friends and acquaintances in a Ghanian mountain village, all to be given to friends and family at home. I was back home for no more than two weeks before I showed off a necklace I was particularly fond of and someone remarked how similar it was to something she had seen at Target. I was brought back to this thought and what it means by a great last-page essay in the strong Philadelphia sustainability magazine Grid. My travel mate Sean Blanda (left), Zurich, Switzerland couch surfing host Dule Misevic, and myself in November 2008. A full-length travel story of mine focused on the five year anniversary of CouchSurfing.com at first destined for the Philadelphia Inquirer last January never found a home there. After a back and forth, I went another direction and it got a tad stale for the daily’s travel editor. So, because I’ve shared other stories that didn’t run as planned, I’ll do so today. Additionally, as always, I also like to share some grafs that were reworked and items I cut from my original story, which also can be seen below. ZüRICH, SWITZERLAND — I just can’t find chopped beef for cheesesteaks anywhere. But cheese? Well I have my choice of cheeses in the largest city of this European country known for its favorite holey dairy product. I snag a jalapeno-laced Swiss cheese and settle for a pound of ground beef I plan to mince. After picking up fresh rolls, peppers and onions, I am back climbing hilly Kornhausstrase, a busy road northwest of the city center that rides over the Linth River to Zurich’s residential neighborhoods. As a jet-setting tourist, this is a part of Zürich you would never see. Unless, of course, you are couch surfing, which is why I am here. CouchSurfing.com, the online hospitality-exchange giant, is celebrating six years this month and has nearly 1.6 million members, but it hasn’t lost its mission. 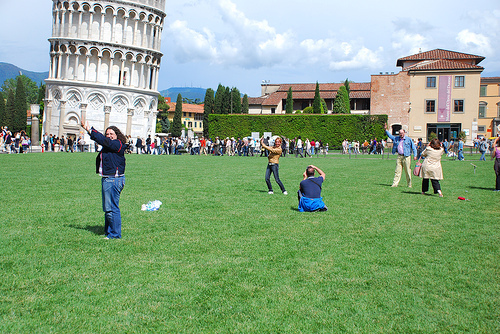 For five weeks in fall 2008, I made something new of the tired European backpacking trip by hopping from one stranger’s couch to another, not for money, but in the name of cultural exchange. I never had a better experience than my first, sleeping on a tan couch in the leafy northern extreme of Zürich, Switzerland. Travel is most often the privilege of the privileged. Two years ago last month, I was returning from a trip that was certainly a great privilege. If you can’t go out to eat with friends without referencing something you learned or experienced from some travel experience you had, then I think you’re doing it wrong. Great travel writers, I think, tend to have always done so for a personal love for travel — not primarily to be a travel writer or to tell someone else about what you did. Of late, I was reminded. I was asked to guest post on Dateline Accra, the small, personal travel blog of Stephen Zook, a young journalist whose spirit I adored when I was editing his copy a few years ago at The Temple News, the college newspaper I once worked and this year he’ll lead. He is studying in Accra, the capital city of Ghana in West Africa, this summer. Don’t be afraid of the satchel water. Pretty quickly on in the urbanized sprawl of greater Accra in coastal Ghana, you just might notice that the kids buy plastic bags of water, a corner of which they bite off to chug the contents. If no one convinces you otherwise, you just might stick to the bottled variety. Don’t be afraid of the satchel water — that much I learned. I spent a portion of summer 2005 studying at the University of Ghana in East Legon outside of the capital city of Accra. It wasn’t long enough to fully familiarize myself with even the university, set aside the city, the country or the region and Hell if I have even a taste of the continent, as one of the great lessons from travel should be that cultural learning comes from decades not days in a place. I did, however, pick up that the satchel water was refreshing, cheap and unique. Read the rest here. Before he left, I promised him a beer when he returned. Now, I think he owes me one. I hope he has a transcendent summer, explores and shares everything he can on that site. I also hope he builds traffic to share his story. He’s using Twitter, though he has some ground he can certainly make, as he’ll have plenty of compelling stories to tell. Of course, this made me realize I follow a handful of low-traffic, personal travel blogs of friends or acquaintances who offer interesting reading. After the jump, peep seven such blogs that might be worth your time, whether you know the writers and their locations or not. Standing with Sean Blanda and his brother Brian in Zurich, on the dock described in my Inquirer story below. A personal journey essay of mine appeared in today‘s Sunday edition of the Philadelphia Inquirer. If I keep my hand steady long enough, I just might get a photograph of me racing down the steepest hill in Zürich on a bicycle. But I’ll have to settle for the shot of me standing on a dock on Lake Zurich, shadowed by the yellow sun, framed in crystal blue skies, as I peer at the Swiss Alps, not 20 miles away. Read the rest here. See related video, another photograph and read some details on the story below. This is a conversation I’ve had too many times. I am in Washingto D.C. today, the day after Martin Luther King day, for the inauguration of Barack Obama. While I will have much more to say on that in coming days, being here reminded me of how often we in the mid-Atlantic take for granted what we have: five of the most influential cities in the country and among the more meaningful in the world. All Americans have relative access to them, but the densest collection of our residents can visit Boston, New York, Philadelphia, Baltimore or Washington D.C. for the weekend.